My comic addiction started with Classic X-Men, which reprints Uncanny X-Men #93 onward and includes secondary stories that transform the characters from superheroes into actual human beings. 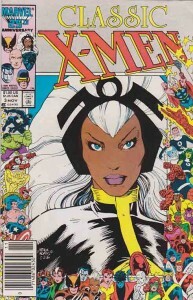 Classic X-Men #3 was one of the first issues I read, and it didn’t take long for Storm to become a favourite. If you assume my adoration of Ororo Munroe is based solely on the fact that she and I share similar skin tones, I will have to scoff at you and move on. And if you think I love Storm because of her incredible powers, leadership abilities, and goddess status, then I will have to shake my head and look at you with pity. Because there is so much more to Storm than that.